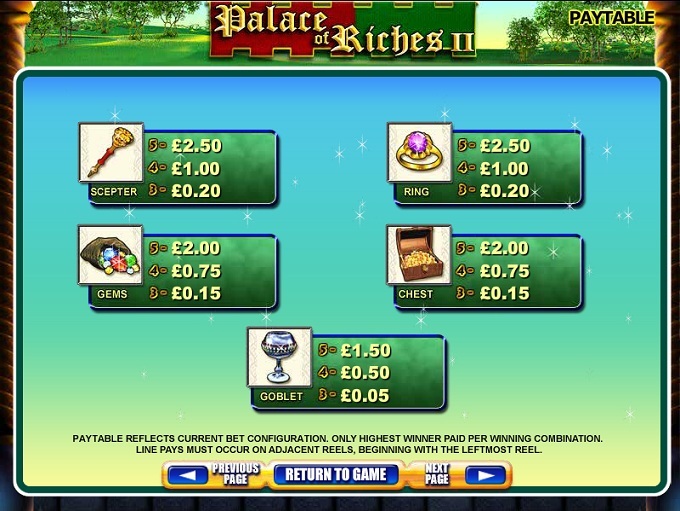 In Palace of Riches II, you are going to be shown the glamorous part of Medieval Europe, the one where you get kings and queens, chests filled with gold coins, gem encrusted drinking goblets and all sorts of other pieces of jewelry. It was considerably dirtier and less appealing in real life, but that wouldn’t make for a very good slot machine topic, so naturally we’re getting the pretty version here. WMS has created this particular game. 5 reels are used in Palace of Riches II, with 30 paylines available. 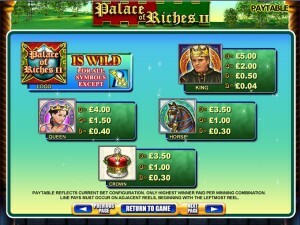 The feature list includes a lot of free spins, scatter symbols and the usual wild. As for the prizes, they reach a top value of $2,500. 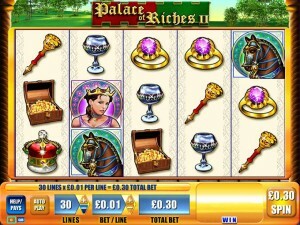 As far as features are concerned, the game will offer you wild symbols, some scatters and quite a few free spins. 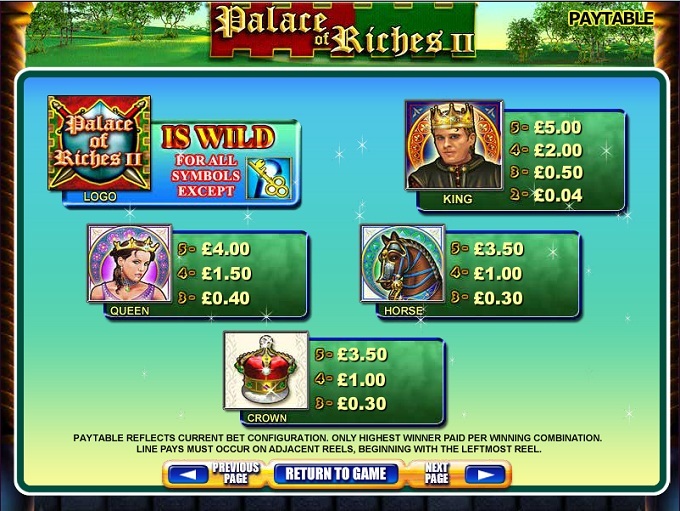 We have the Palace of Riches II Logo in one of the main roles, acting as a wild symbol whenever it appears. As the wild, the symbol is the one that can substitute for all other icons that are trying to form regular combinations, which would exclude the scattered Key. Wilds don’t seem to have their own prizes to give away here, which is unfortunate but common enough in WMS slots. The Key scatter is another big part of the game. You will discover this symbol in random positions on the reels, yet it will be able to offer you free spins. Having three scattered Keys will bring you the minimum of 10 free spins. Get four Keys, and you are offered 25 free spins. As for five Keys being present, that will bring you a huge number of free spins, 100 rounds being available in that case. There is even the possibility of retriggering free spins, for which you need an additional 3 or more scattered Keys to appear at the same time. Each of the 30 coins that can be part of a wager have a minimum value of $0.01 and a maximum of $5. You may end up with bets of up to $150, but only if you can afford it, otherwise you have the option to modify the number of lines and the denomination of the coins. The King symbol is the one that pays best, giving up to 500 coins away. The value of those coins goes up to $2,500. The Medieval Europe theme that the game chose to focus on is mostly about the jewelry and the riches that the King and the Queen posses. The background image is a simple picture of the Royal grounds, green and with a couple of trees on them. The reels are the ones that are interesting in this case, all the images chosen for the symbols being themed and usually inspired by something made out of gold. Symbols: Logo (wild), Key (scatter), King (500 coins), Queen (400 coins), Horse (350 coins), Crown (350 coins), Scepter (250 coins), Ring (250 coins), Gems (200 coins), Chest (200 coins) and Goblet (150 coins). The medieval setting is nicely done in this game, and the number of free spins with its 100 rounds is very appealing, but the biggest prizes are quite low, offering only $2,500. 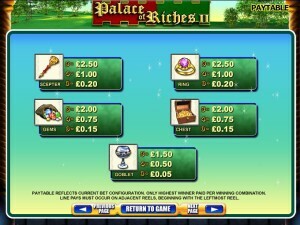 This Palace of Riches II slot is offered by all online casinos with WMS software, playable either in practice or in real money mode.